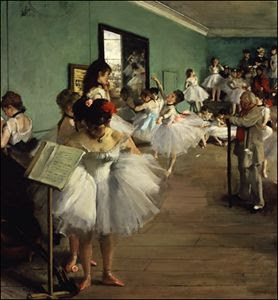 Edgar Degas' The Dance Class was painted in 1876 and depicts the hard labor ballerina's of the time were undergoing. The first thing my attention was drawn to was the girl in the foreground. She seems to be paying no attention to her instructor and appears to be reading the sheet music. Like her, the other girls in the painting appear to be uninterested and ignorant of their instructor. Many of the girls are sitting and appear to be talking to one another. This highlights the labor they were undergoing because their lack of attention and sitting down hints that perhaps they have been working all day, or are overworked. There are still a few girls stretching and the instructor watches them intently. However, the two stretching girls in the center drew my attention to the back of the painting where it looks as if there are two girls sitting on the floor observing their feet in what appears to be pain. Again this suggest that they are overworked and their job is strenuous. What is Degas doing on a formal level?